UPDATE: Robin Harper, MSP, (Green Party) has lent his support to the campaign! A small group of concerned environmentalists are petitioning in order to save an internationally significant orchid from extinction – the Kilsyth South Spider-orchid from Victoria, Australia. 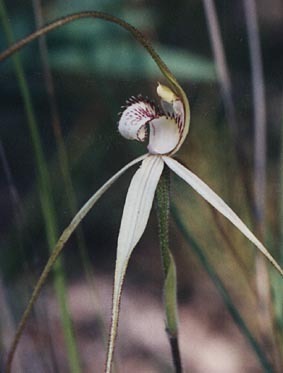 (Caladenia sp. aff. venusta). It is the only one of its kind in the world and only occurs on a privately owned block of land. Only 23 specimens are known. Proposals were made by the owners of the land to clear significant areas of vegetation in order to build a house, however Maroondah City Council rejected the permit and VCAT supported this decision. We now believe that Maroondah City Council and the state government have the responsibility to purchase the land in fairness to the property owners and in order to preserve the orchid. To convince the state and local government that the amount of money required (approx. £200,000) to purchase the private land is worth while, you can also help by writing to the Mayor of Maroondah City Council, or informing any other groups which you believe may assist in this effort. Every letter or email will increase the chances that we can preserve the orchid. Please check this site regularly or email Linda Bester in Australia for advice and campaign updates. I support the campaign to save this critically endangered plant and I would be obliged if you could continue to keep me up to date with information about your work to save the orchid. Reference: J.H.Ross, A Census of the Vascular Plants of Victoria (2000) 144. The species is endemic to Kilsyth South, Victoria. No data is available against this criterion. The species has a very restricted geographic distribution having an area of occurrence estimated at 2ha and area of occupancy estimated at 1ha. The species is known from a single location and a decline is projected due to the proposed residential development of the site. Therefore, the species is eligible for listing as critically endangered under this criterion. The observed population is very low, totaling 23 individual plants. This figure is based on survey work and observations by the nominator over several years ("nearly a decade"). A decline in the number of individuals, area of occurrence and area of occupancy is projected on the basis of proposed residential development for the site and its geographic distribution is thus precarious for the survival of the species. Criterion 4 - Population size. 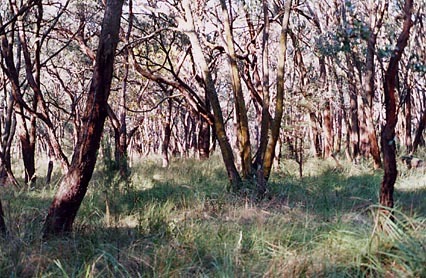 The observed population is extremely low, totaling 23 individual plants. This figure is based on survey work and observations by the nominator over several years. The probability of extinction in the wild has not been calculated. The total population is extremely small, its geographic distribution is very restricted and precarious for the survival of the species and located at a site currently allocated for residential development. The species is eligible for listing as critically endangered under criteria 2, 3 & 4.